Applications for the Global Development Tour 2018 Director and Assistant Director roles are now open: find out more! After the previous day’s tour of the UN Headquarters, we were ready to get back to the UN and hear about what actually goes on there in finer detail. We headed back through security and into a grand meeting room, complete with chairs cosy enough to rival la-z-boys. Reaching peak comfort levels, we settled in for the morning; notepads and pens at the ready in anticipation of the UN Information Programme. First up we listened to Adam Rogers from the UNDP. With an impressive career in UN work for over 20 years, it was a privilege to hear his insights on the Sustainable Development Goals. Rogers mentioned that the SDGs were a good focus for the UN, giving countries clear goals on what they needed to achieve. We then heard from Tarik Jasarevic from the World Health Organisation. Tarik told us that a current threat to world health is the emergence of lifestyle diseases, such as diabetes. This reaffirmed what we suspected about the SDGs – the goals apply to not only developing nations, but first world countries too. 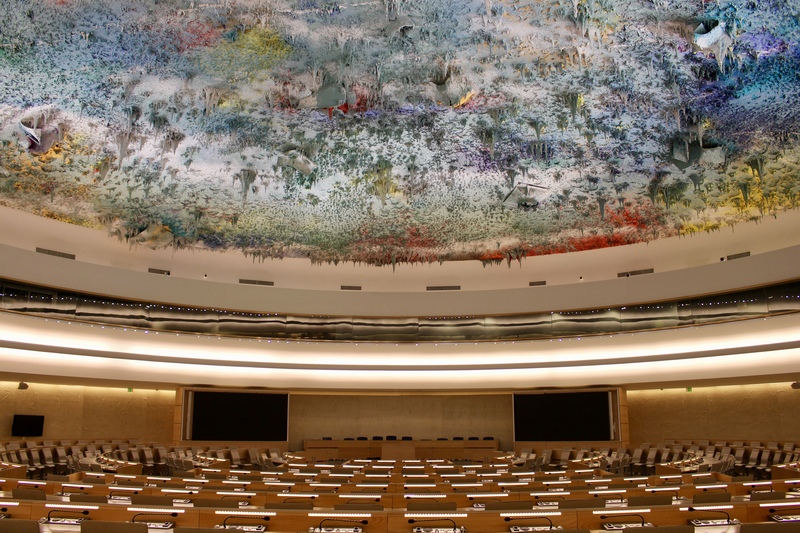 It wasn’t until 1pm when the group encountered the pièce de résistance of the Geneva Office – the UN Cafeteria. From the tray tables stamped with the UN logo, to the fully stocked candy bar, the group was in paradise. It has also been reported that a rare peace treaty was struck up between Mitch and David on the rights to stashing the group’s chocolate for later consumption. We then had the opportunity to visit the Red Cross Museum nearby. With the assistance of a technologically-advanced audio guide, we split off to explore the three main exhibitions of the museum – Defending Human Dignity, Restoring Family Links and Reducing Natural Risks. A highlight for many was the large interactive touch screen table where we played Hurricane, a game in which one assumes the role of the Red Cross to help a virtual island get through a natural disaster. This required co-operation, communication and concluded with cheering when we topped the high score. Perhaps we have some budding future Red Cross volunteers among us, who can say? 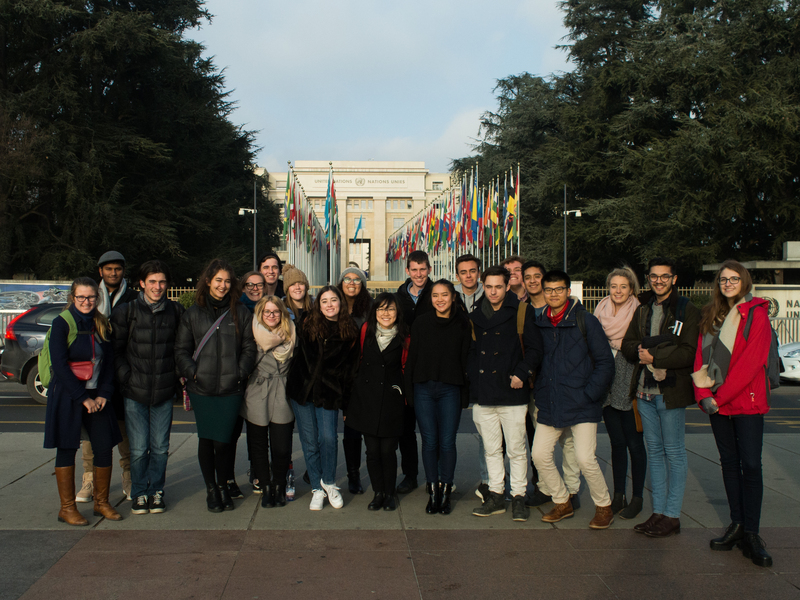 Our next day in Geneva was a free day and we certainly made the most of it. Some ventured out into the -3 degree chill to capture the frozen beauty of Lake Geneva on their cameras. Others took advantage of the indoor (and considerably warmer) Geneva shopping scene. This caused some bags to be slightly heavier than before, but without the worries of inflight baggage weight allowances, we could breathe easy. That’s right, we were off to Paris on not a plane, but a train! It was time to say au revoir to the Swiss Franc and re-bonjour to the Euro. After a smooth ride on the train tracks en route to Paris – we arrived late at night in the city. With a promising view of the sparkling Eiffel Tower out some of the hostel windows, we were excited to see what Paris had in store for us the next day.